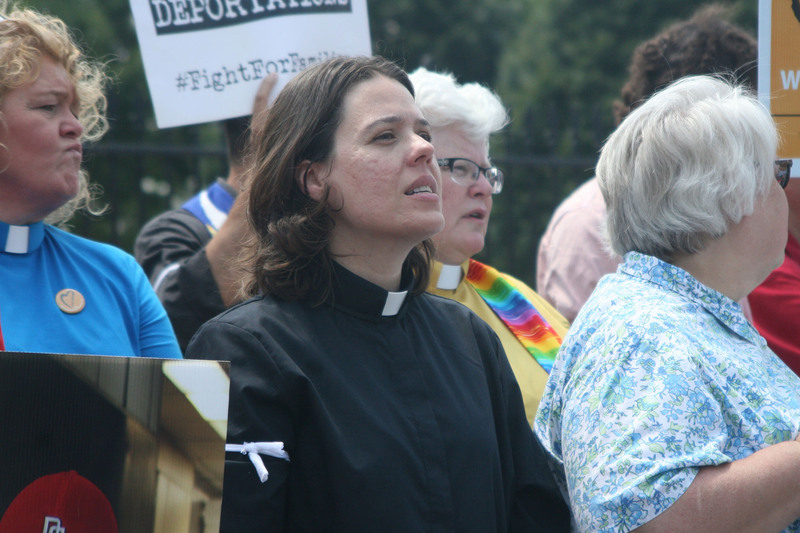 WASHINGTON – A Phoenix minister was among a group of religious leaders and immigration advocates arrested Thursday at the White House, where hundreds turned out to demand a halt to deportations. The Rev. Susan Frederick-Gray of the Unitarian Universalist Congregation of Phoenix spent several hours in detention Thursday before being released, with plans to continue rallying against deportation this weekend. “I came to the White House to bring a message to President (Barack) Obama to extend deferred action to all undocumented immigrants and to stop the deportations,” she said late Thursday. At the other end of Pennsylvania Avenue, meanwhile, the House canceled a vote Thursday on an emergency funding bill to address the crisis of children illegally crossing the Southwest border. That dimmed hopes for action, as Congress gets set to leave on its August recess. 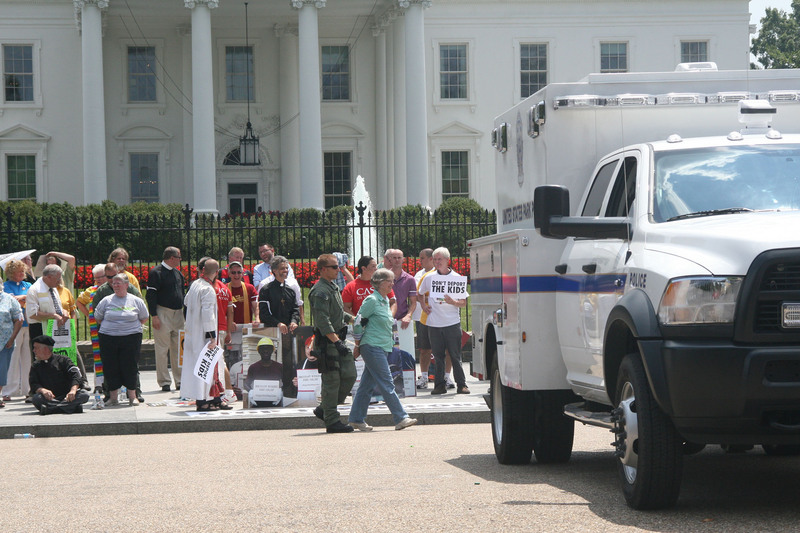 “We thought it was a pivotal moment to do this because Congress has run out of time,” said Ryan Murphy, an organizer for Sisters of Mercy and the Americas, just one group participating in the White House protest. “The time has come and passed and we’re demanding that Obama takes immediate action … to alleviate and stop mass deportations,” Murphy said. The House was scheduled to vote on a bill to spend $659 million to increase border security, add National Guard troops and speed review of the cases of Central American minors who have been pouring across the Southwest border in recent months. That measure was well shy of both the $3.7 billion that Obama requested earlier this month to deal with the crisis, and the $2.7 billion measure being considered in the Senate. Both of those bills would have dedicated funds to the Department of Health and Human Services, which is responsible for caring for those children while they are awaiting a hearing. The House bill includes much less funding for HHS. The House did add a provision, however, to change the current law so that illegal immigrants from Central America can be treated like those from Mexico and Canada, who can be turned back more quickly. Currently, Central American children have to be turned over to HHS or placed with a family member here before they have a court hearing. The bill was scheduled for a vote Thursday but was pulled, and House Republicans were meeting on it Thursday afternoon. More meetings are scheduled Friday, but some lawmakers were not optimistic about the outcome. While Congress may be deadlocked, Frederick-Gray said she thinks advocates are making a difference. 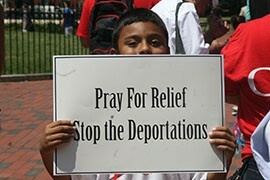 “This was the largest action on immigration in front of the White House. There was an unprecedented amount of religious diversity and religious leaders who were a part of this action,” she said. “In the midst of Congress’ failure to act, we need to stop the deportations and bring relief to the millions of families who are living in fear and in the shadows and are being devastated by our deportation system,” she said. The Rev. 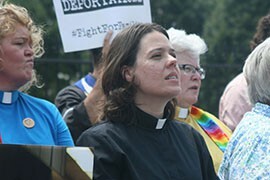 Susan Frederick-Gray, of the Unitarian Universalist Congregation of Phoenix, at a White House protest against deportations of immigrants here illegally. Frederick-Gray was later arrested during the rally. 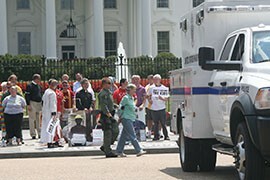 A protester is cuffed and led away by police during the anti-deportation demonstration outside the White House. 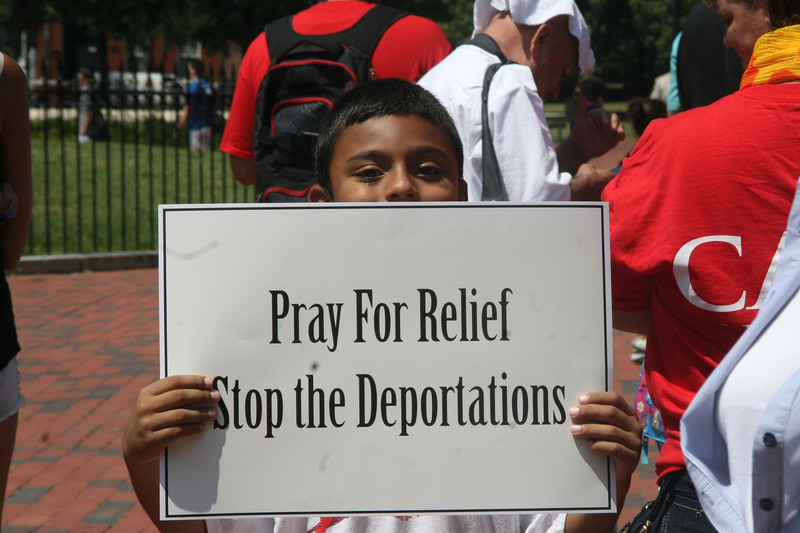 A young demonstrator makes his feelings known during an anti-deportation protest at the White House where a number of protesters were later arrested, including a Phoenix minister.